Shopping for a new Mazda CX-9? Though the Signature is attractive with all the bells and whistles, the CX-9 Touring with all-wheel drive and the Premium package offers many of the same features for a significant discount. For 2019, Mazda has given the CX-9 more desirable tech to keep it fresh, including Apple CarPlay and Android Auto at long last on Touring and above, 3 years of SiriusXM satellite radio, weather, and traffic, and new optional displays, power features, and trim pieces. The 2019 CX-9 is offered in Sport, Touring, Grand Touring, and Signature trims, and front-wheel drive is standard on all models while all-wheel drive is an option on each trim for $1,800. Each CX-9 gets a 2.5-liter turbocharged 4-cylinder as standard, making 250 horsepower on premium fuel, good enough to match the V-6 power delivery of many competitors. A 6-speed automatic is the only transmission option and feels dated compared to the relatively modern powerplant. A hallmark of any modern Mazda, the CX-9 is sprightly and engaging to drive, with light-but-direct steering and handling moves that would make some sedans blush. This large crossover is geared more for comfort than many other Mazdas though, so expect slightly less handling prowess than some smaller models. The 2019 CX-9 also delivers on safety, with five stars from the federal government and a Top Safety Pick award from the IIHS, with special consideration for its optional active safety technology. We wish it would come standard, but at least it’s available on all trims for as little as an additional $1,290. 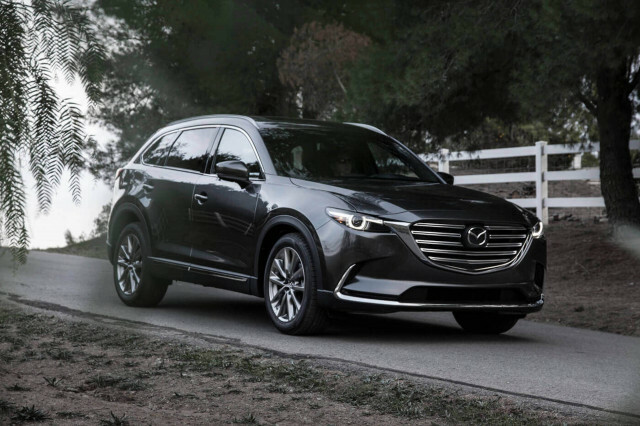 Unfortunately, forced induction doesn’t equal stellar fuel economy in this case, as the CX-9 manages only 23 or 24 mpg in combined daily driving. The CX-9 is exceptionally handsome, especially for a crossover, so if style and features are paramount but badge is of little importance, this Mazda represents an appealing near-luxury alternative to many more expensive options. The 2019 Mazda CX-9 is one of the best-looking crossover SUVs out there, luxury badge or not. As many SUVs get more angular, the CX-9 makes do with hardly any straight lines, proving that curvy can still easily be beautiful. 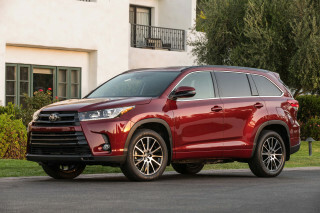 A sleek front end, sporty silhouette, and tapered rear coupled with big wheel arches and handsome LED running lights make for a luxury-looking SUV at a serious discount that looks good in almost any color, save for white. A low-slung dashboard and stick-up infotainment screen keep the interior design relatively simple, while clever touches like the vent trim continuing onto the door panels give this mainstream crossover an upmarket feel. The Signature trim adds fine leather and real wood accents, but the base-level materials still feel a cut above. The 2019 Mazda CX-9 could use an updated transmission, but handling is fine. All CX-9 models get a 2.5-liter turbocharged inline-4 with 250 horsepower and 310 pound-feet of torque, providing power similar to the V-6 versions of many of its competitors. With regular fuel, the power figure drops to 227 hp, so be sure to put in premium for best results. Front-wheel drive is standard across the range and all-wheel drive is optional, but the CX-9 only offers a 6-speed automatic transmission that frankly feels dated and somewhat sluggish. It also extracts a modest fuel economy penalty compared to rivals. Thankfully, this Mazda delivers in the same area all of its stablemates do: handling. The CX-9 has moves like a much smaller SUV, and though the steering is somewhat light, turn-in is precise and grip is excellent, especially with all-wheel-drive. Though not as comfortable as some others in its class, the CX-9 can be plenty plush on smaller wheels, namely the 18-inchers that come standard. Though offering three rows, the 2019 Mazda CX-9 is best used as a large two-row crossover. Though most trims get power-adjustable seats as standard, the CX-9’s thrones could use some more cushioning, as most are relatively firm even on top-tier trims. Second-row passengers fare better, with more legroom than the Honda Pilot and manual recline, though the benches are relatively flat as well. The CX-9’s third row is clearly an afterthought and should be treated as such, only used in a pinch to fit kids, as it doesn’t have quite enough space for adults. Behind the third row, the CX-9 manages 14.4 cubic feet of cargo space, but most of that is below the steeply-raked window line, so taller items won’t fit easily. That figure expands to 38.2 cubic feet with the third row stowed, and we recommend keeping it that way most of the time. The 2019 Mazda CX-9 delivers strong safety scores and active tech that while not standard is available on every trim. The 2019 CX-9 gets five stars overall from the NHTSA, but only four stars in both the driver and passenger side frontal crash and rollover categories. 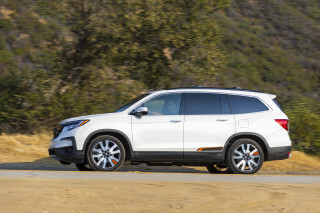 The IIHS saw fit to award it a Top Safety Pick award for 2019, however, with the “+” designation missed because of “Acceptable” headlights, a common problem for crossover SUVs this year. 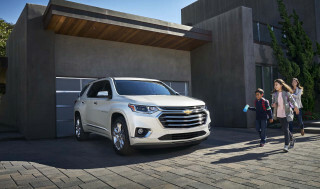 Front crash prevention technology is rated as “Superior,” but only comes with an optional $1,290 package on the base Sport trim, though it is included on higher levels. This suite of tech includes blind-spot monitors, active lane control, lane-departure warnings, a surround-view camera system, adaptive cruise control, automatic emergency braking with forward-collision warnings, and automatic high beam headlights. The 2019 Mazda CX-9 offers solid standard features and more tech this year, a welcome addition. Three-row crossovers are popular but can get very expensive, very fast. Fortunately, the 2019 Mazda CX-9 offers the best value at the middle of the range, so skip the enticing Signature trim to save a pretty penny. Available in four trims – Sport, Touring, Grand Touring, and Signature – there are no shortage of CX-9 variants to choose from, all with differing levels of luxury and comfort features. 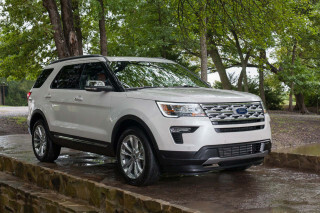 The Sport model comes with 18-inch alloy wheels, cloth upholstery, three rows of seats, Bluetooth connectivity, and a 7.0-inch infotainment screen as standard, and offers power seats and the active safety feature suite for an additional $1,290. Stepping up to the Touring trim adds Apple CarPlay and Android Auto compatibility for 2019, as well as leather, an additional 1 inch of infotainment screen, a power liftgate, and power-adjustable front-seats as standard. That combination is easily the best value in our book at just $36,525 for the front-wheel-drive model. 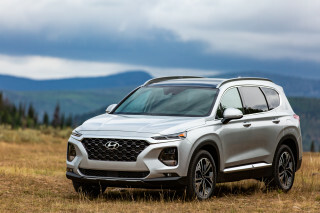 The Grand Touring trim adds 20-inch wheels, active safety features, a dual-pane sunroof, parking sensors, a head-up display, heated front and second row seats, a heated steering wheel, and adaptive headlights. Signature trim CX-9s are top-of-the-line, with Nappa leather hides, Bose audio, rosewood trim, LED headlights, and interior accent lighting. Though the infotainment system is updated with Apple CarPlay and Android Auto, it can still be clunky to use with the clickable dial the only interface. Entering navigation destinations manually can be a patience-testing affair. Though combined fuel economy is average, the 2019 Mazda CX-9 could benefit from a more efficient model like a hybrid. According to the EPA, front-wheel-drive CX-9s manage 22 city, 28 highway, and 24 combined mpg while all-wheel-drive models drop to 20/26/23 mpg. Premium fuel is required for maximum power output, but if you can live with a drop in performance, regular fuel can be used instead. Looking for a different year of the Mazda CX-9?